AoT CO will be hosting our third event of 2019 at Gunbarrel Brewing Company in Boulder, CO from 7-9pm on Tuesday, April 9, 2019. Doors open at 6:30pm. Free tickets available via Eventbrite. 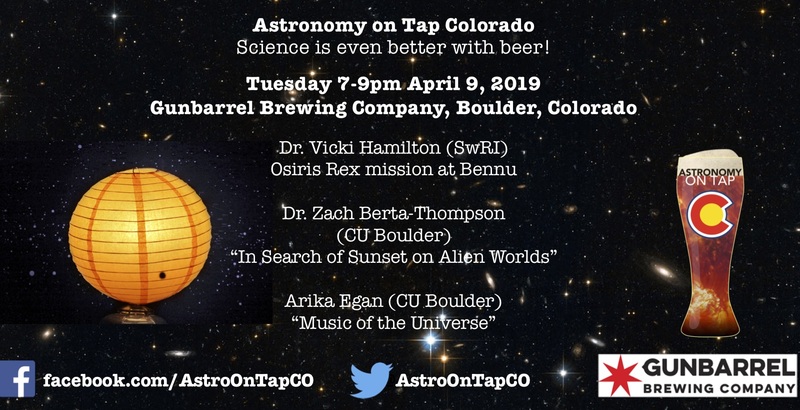 At this event, Dr. Vicki Hamilton (SwRI) will talk about the Osiris Rex mission, Dr. Zach Berta-Thompson (CU Boulder) will share his thoughts on “In Search of Sunset on Alien Worlds”, and Arika Egan (CU Boulder) will illuminate our minds with “Music of the Universe”. We will be raffling off some fun astronomy items too! Follow us on Facebook and Twitter. ← Astro on Tap NYC 6th Orbitversary!